Pre-heat the oven to 350 degrees. This recipe makes 14 muffins. In one bowl combine all the dry ingredients. In another bowl combine all the wet ingredients. 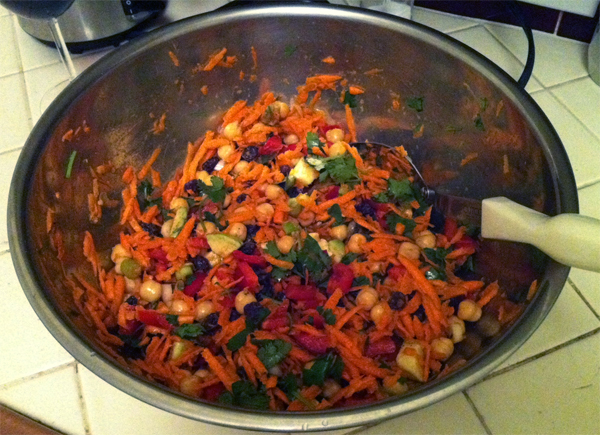 Combine the wet & the dry ingredients together in one large bowl. Use a non-stick cooking spray in your muffin tin. Bake at 350 degrees for 20 mins then remove and cool. Wrap the muffins individually in plastic wrap and store in the fridge as they dry out easily. 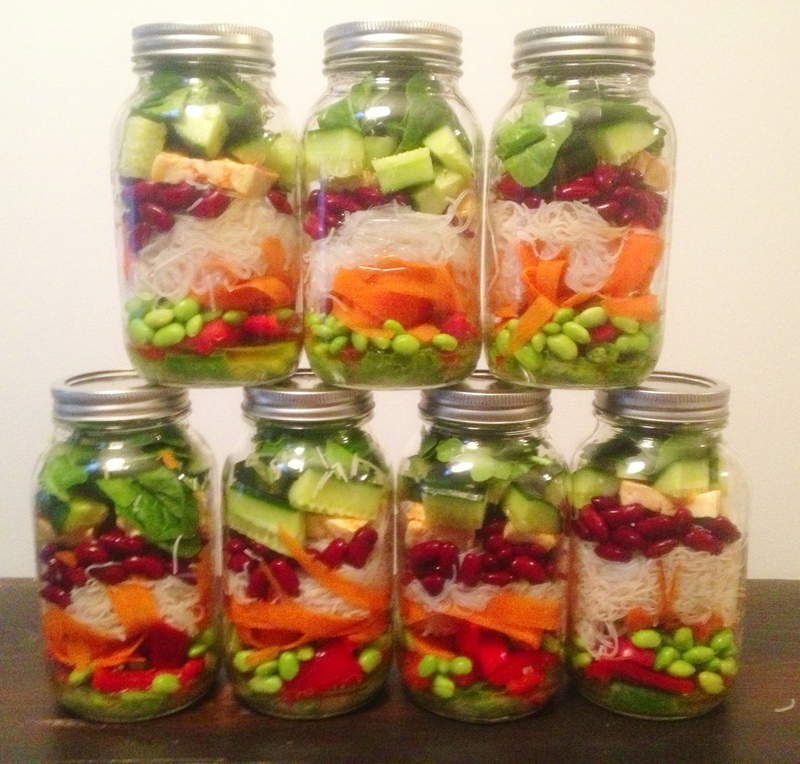 Jars will keep for 4-5 days, just keep them upright and only shake in the dressing when you’re ready to eat them. The idea is the ingredients at the bottom (Sugar Snap Peas & Red Peppers) will sit ok in the dressing for several days. Dressing. Amount of dressing used per jar is down to personal preference, below was enough for me for 2 jars (I used 1L Mason Jars.) I think you could easily sub in any vinaigrette based dressing here instead. Salad. Put the dressing in first. Ingredients are then layered in, in the order shown from the bottom up. I think the ingredients used here are pretty flexible based on personal preference; just be sure to use ingredients in the bottom that can sit ok in the dressing for a few days. 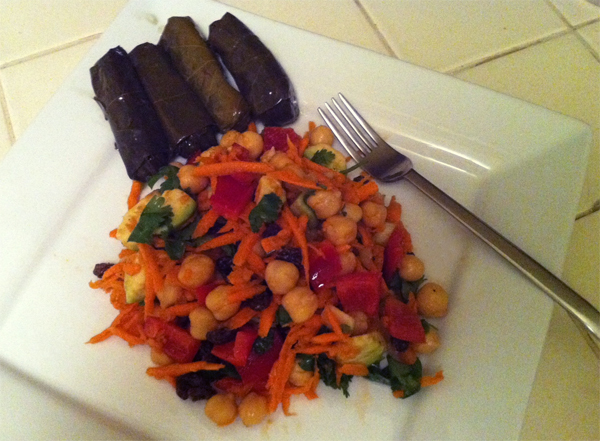 Recipe adapted from one originally by Lynda Diamond in Impact magazine. This is lightly adapted from `Vegan Family Meals` by Ann Gentry; a book given to me for my birthday by my very good friend Lucy. Heat the oven to 500. In a large bowl toss the tomatoes, 1/4 cup Olive Oil, 1/4 cup Balsamic Vinegar, 2 tsp Salt & 1tsp Black Pepper. transfer the mixture to a large heavy rimmed baking tray (arranging the tomatoes in a single layer skin side down) Roast until the tomatoes are charred on the edges, around 40 mins. Heat the remaining 2tbsp of Olive oil in a large pot over a medium heat. Add the onions & the remaining 1tsp Salt. 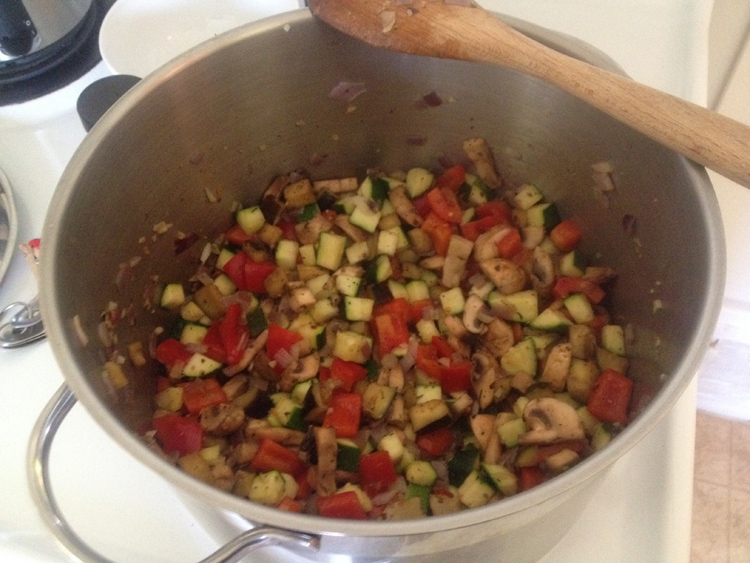 Stir often, until the onions are soft (around 10 mins) Add the Basil, Parsley & Tyme and saute for about 1 min. Stir in the roasted tomato mixture and bring to a simmer. Add the Veg stock (or water) and simmer for around 8 mins. Heat the oven to 375. 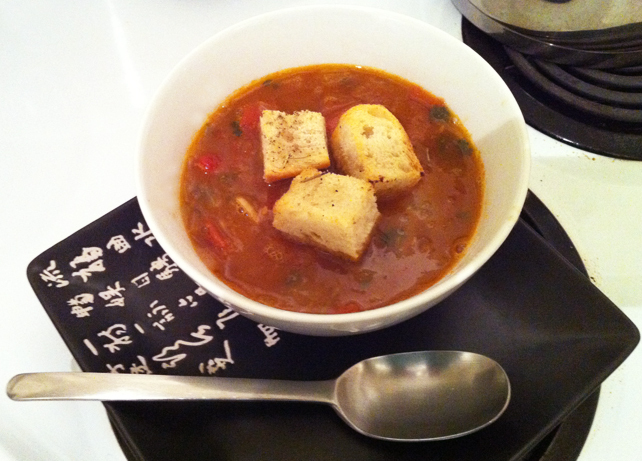 Toss the bread cubes, Basil, Rosemary, Black Pepper & Salt in a bowl. Drizzle the Olive Oil over the bread cubes. Arrange the bread cubes in a single layer on a rimmed baking sheet. I always used to throw the Halloween pumpkin seeds away, but this year I thought i’d try and do something with them. 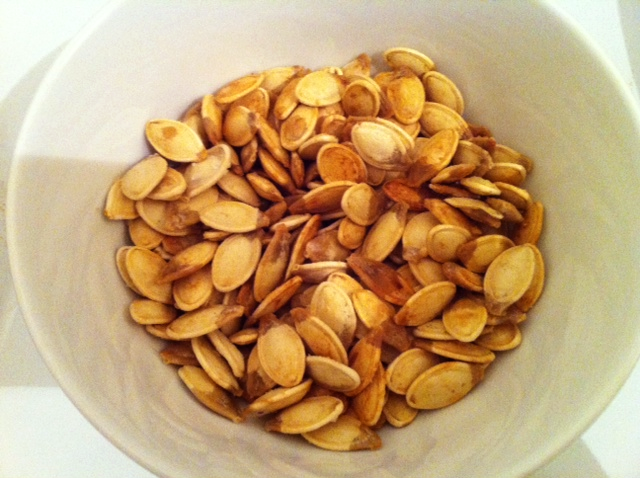 Turns out toasted pumpkin seeds are really tasty… who knew! Pre-heat the oven to 350. Pre-Boil the pumpkin seeds for 10 mins in Salt Water. 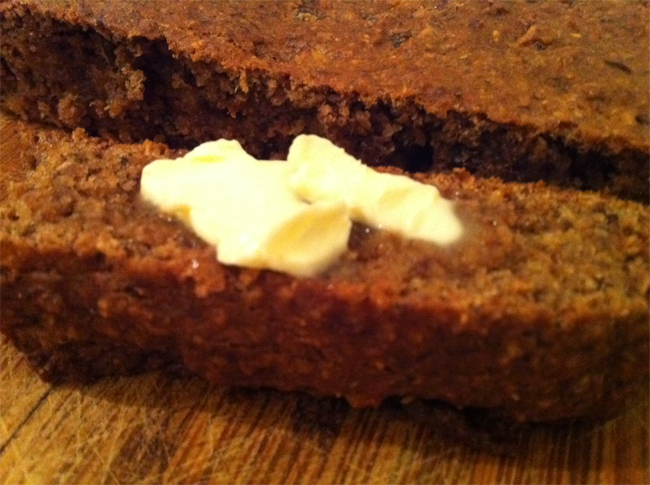 Spread the melted Butter, Margerine or Oil onto a baking tray, spread the seeds out on top and sprinkle with salt. Bake for 20 mins, turning half way through, until browned. Can be enjoyed whole, no need to shell. 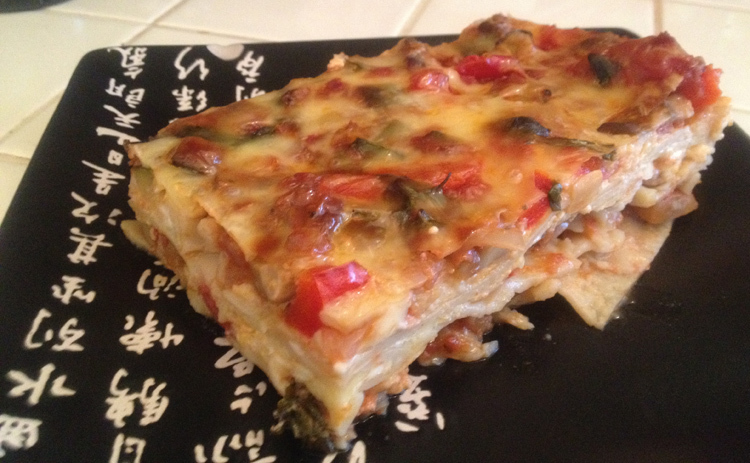 Really easy to make, and ingredients can be added or subbed, as it’s very forgiving. 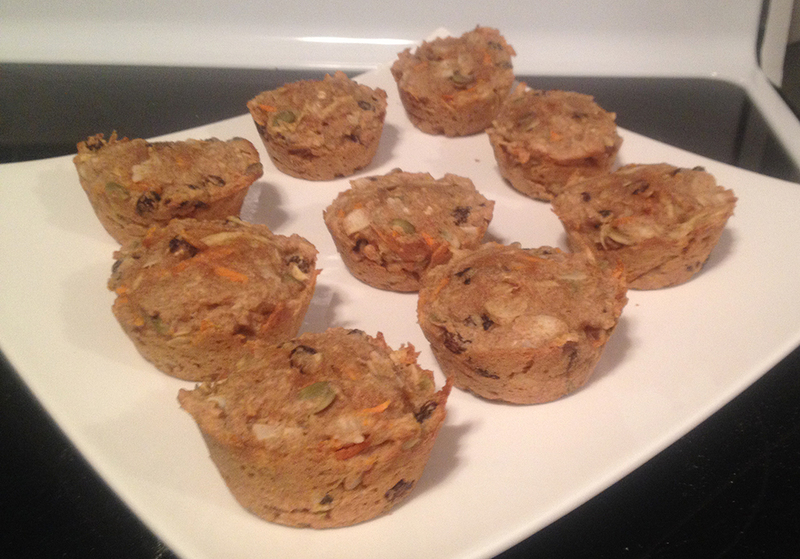 Very similar to the muffin recipe from before, but this time it`s Vegan. In a Bowl Combine the dry ingredients (Ground Flax, Spelt Flour, Baking Soda, Cinnamon, Nutmeg, Raisins & Salt.) In another bowl combine the wet ingredients (Bananas, Canola Oil, Maple Syrup, Vanilla Extract & Apple Sauce.) Add the wet ingredients to the dry ingredients. 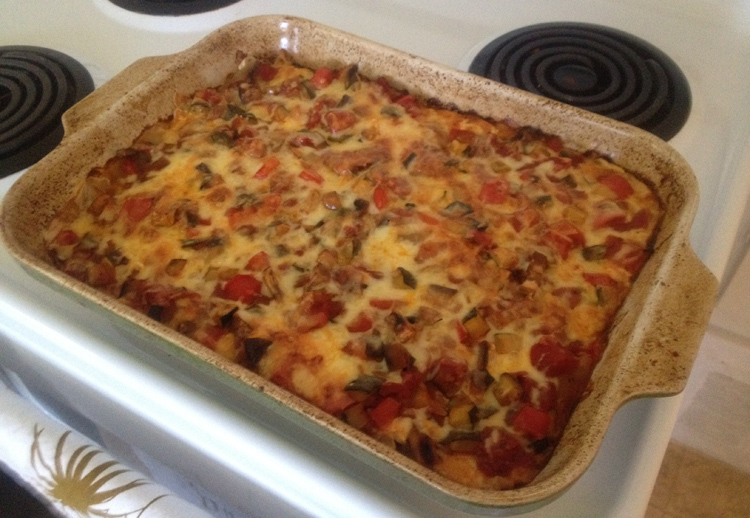 Grease a 9″ loaf pan (or equivalent) and spoon in mixture.